Any room may have an inspiration piece the design evolves around. For a snowbird couple that spends summers in the Hamptons, it was a beautiful slab of gray and white marble for the countertops. The clients wanted a contemporary kitchen with edginess but traditional bones. Kukes achieved the look with contemporary lighting and barstools played against painted wood paneled cabinetry. “Everything is back from the ’80s, including Lucite,” she adds. The clients wanted a table and chairs despite the small space that was left because they didn’t want to have to sit at the island. She selected an Eero Saarinen Tulip table (also back with a vengeance) with contemporary lace-back chairs. The husband is a self described TV addict and the flat-screen television in the kitchen is one of 14 in the penthouse. A kitchen does not have to be big to be beautiful. Designer Andy Fischman transformed a cramped and uninviting 13-by-7-foot condo kitchen in Lauderdale Tower into a stylish and functional space perfect for entertaining. The couple, snowbirds from Montréal, hired him to finish the work in anticipation of moving to South Florida full time. He tore down a wall with a pass-through to create an open design that features three ways to get into the kitchen. An essential structural column was his biggest challenge. His solution? Cladding the column in semi-precious blue quartz porcelain slabs to create a stylish focal point. The other inherent challenge was to provide the large appliances the client wanted. The refrigerator is 36 by 72 inches and he had to situate the oven so the door could open fully and still preserve the large drawers for pots. A shallow high storage cabinet covered the air conditioning duct. 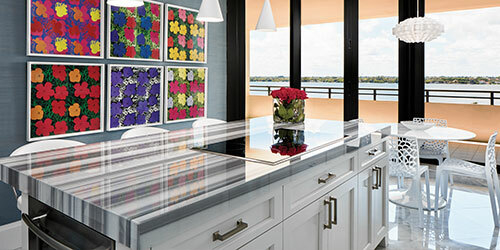 Fishman selected Linear Silver Glossy Acrylic for the cabinets, Snow Quartz quartzite for countertops and backsplash of 4-by-12-inch back-painted glass tile. President Reagan’s famous “tear down this wall” challenge to Mikhail Gorbachev in the ’80s might also apply these days to what designers are telling clients who live in older condos. Mayda Zayas-Bazan says clients want the open look and an ability to enjoy the ocean or Intracoastal from the kitchen. Sometimes, that means taking a wall down. She prefers to use Porcelanosa’s sleek lacquer cabinets and high-end appliances from Dacor and Miele. Microwaves are placed under the counter to unclutter the design. One of the best examples of how she uses color is the pear green color splash she used in a Highland Beach condo the client turned into a rental. She added two ceiling-height pantries in pear green and repeated the color in the base of the peninsula and around the refrigerator. 3484 NE 12th Ave., Oakland Park, 954-556-3751, alliedkitchenandbath.com. Kukes and Simons Interiors, 31 NW 13th St. # 37, Boca Raton, 561-391-7980, kukessimons.com.